The only thing green this vintage 1970′s terrarium has ever been home to is if some candy happens to come in a green wrapper. 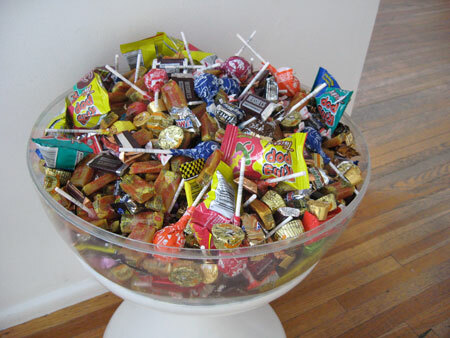 It’s never housed any plants, little rock gardens or anything else that one might find in a planter but, rather, has been a big, fat bowl of sweets its whole life. 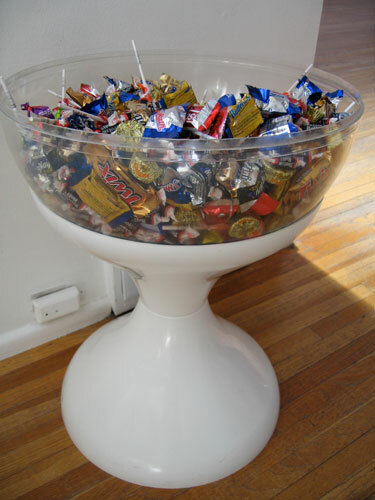 One might assume this only happens around Halloween but this candy bowl may as well be cemented to the floor as you enter my dining room for as popular a piece as it is. No one has ever accused my house as being a haven for the health conscious. 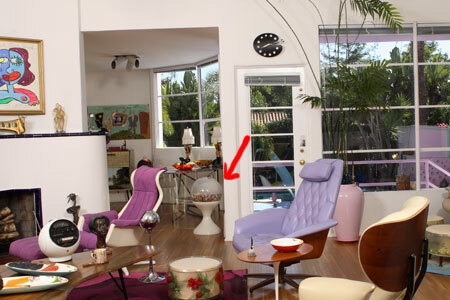 Candy abounds as sugar charged brains fit the mindset of Atomic design, not to mention a house that was built to be a party house year-round as mine was when it was built in 1937 as the party house for MGM. 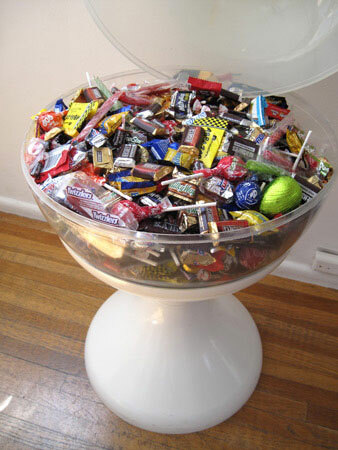 But one thing I can tell you about candy, unless a doctor has given you a skull and crossbones prescription for no sugar, even the staunchest vegan can’t pass up this candy bowl without dipping their hand in. It doesn’t even look full in this photo but it can hold up to 25 pounds of candy with the lid on. I can’t take a photo of it overbrimming now as everything has been dumped out of it and put in little bags all ready to hand out for Halloween. I don’t dare leave the terrarium out on my porch as I can’t risk that some clown, avatar, angel or cowboy has a developed enough design aesthetic to know that the terrarium is the real treat and not the candy and takes that home instead. Happy sugarcoated, caramel filled Halloween! 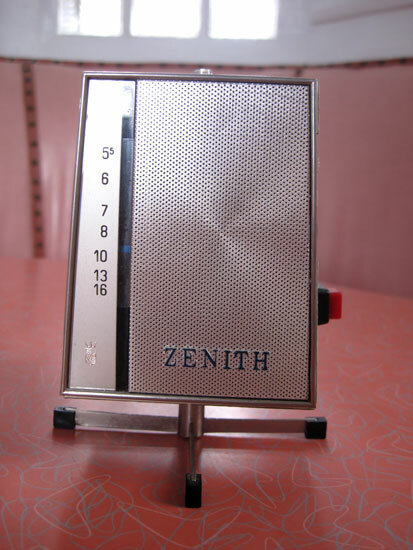 I love this 1950/60s clock radio so much because it looks exactly like can openers of that same vintage did. I kept it in my kitchen for years, and with as much cooking as I did often held a tuna fish can up to it looking for what I hit to make it open. I always pressed this red button expecting some magic magnetized arm to pop out. What to do with gum when you’re done chewing it or have to get rid of it for whatever reason can be a bit of a muddle if you’ve already thrown the wrapper out, which most people do upon opening. Especially when it’s only a temporary landing and you may want to stick the chewable back in your mouth at a later, through hopefully soon, point. 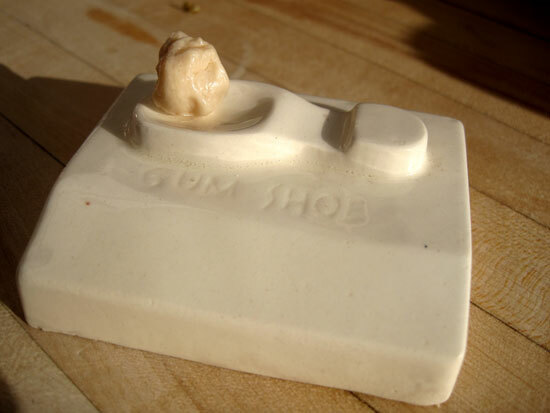 That’s where this Gum Shoe, a place to park your gum, is brilliant. Though I can’t say I really understand its construction as so little of the real estate is devoted to the concave surface upon which the gum is to be placed. Unless it’s for a lot of different people’s gum, in which case the heel and all surfaces of the base seem like prime resting spots as well. Though that seems so gross, a bunch of little germ mounds begging to be redeposited in the wrong mouths. So I just keep my Gum Shoe on the windowsill in my kitchen where it’s also home to rings and anything else that may need to be redeposited on my body once I leave the sink area. 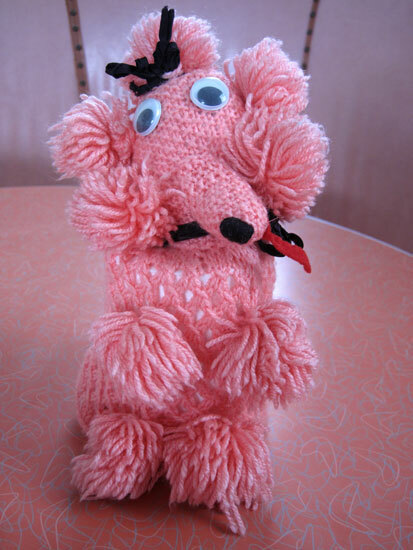 I always love handmade crafts, especially these Knit-Wit kind of animals, usually poodles, that are more often than not made to fit over either liquor bottles or toilet paper. This one with the wayward tongue was made to fit over toilet paper but the crafter either ran out of yarn or was sneaking nips from the bottle as they only equipped the canine with a mini skirt, not enough to even pull over a full roll. I never learned how to play Chess. Checkers was way more my speed, especially as I loved the sound the vintage wood ones made as you plunked them down on the board. Plastic ones sounded good too and that was about as complex thinking as I was willing to ponder when it came to games. My standards were always based on design, what sound do the game pieces make, how do they feel texturally, how’s the color palette, etc. 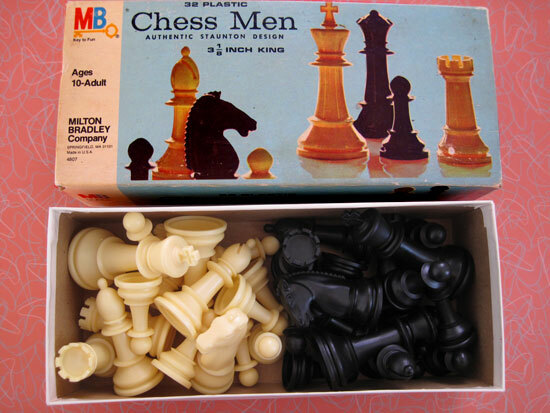 Mind you, I love the sound these plastic Chess Men make clicking together too. But for Chess you also have to burrow way deep into your brain to strategize about where to move them and I like to reserve those deep recesses for things like writing songs, painting and knowing the quickest routes to local thrift shops. One thing I could always wrap my brain around though was excellent packaging. 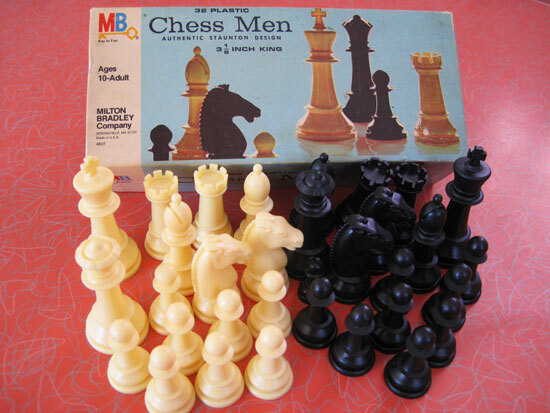 And the color technique for cheap, stripped down, straight-to-the-point things like Chess was excellent in 1969 when this was made. It’s been dripping for days in LA. I used to spend so much time looking for my umbrella, the rain would end before I even made it outside. So began my umbrella collection. Of course, then I could never bring myself to use any of the vintage ones I collected because they would get ruined in the rain. So I started buying a bunch of cheap ones, of which this lipstick umbrella, picked up at the 99¢ store about 10 years ago, was one of my favorites. But it’s soooooo cheap that the first time it rained after I bought it I never got it to fold up again to fit back into the cheap white plastic tube. Soooooo cheap that even just lying in my purse the tube got poked full of holes from my pens. 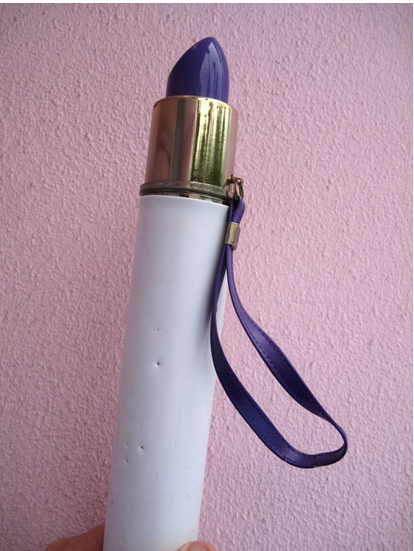 So I tossed my crippled lipstick umbrella out and headed back to the 99¢ store where I bought the last one on the shelf and committed to never opening it so I could preserve its lipstick loveliness. This became a persistent problem every time it rained as I struggled whether I should get my one-time-only use out of the umbrella or preserve it for my kitsch collection as I was also always the type to leave my umbrella at whatever destination I happened to be in should the weather have cleared before I left to come home. There’s absolutely nothing right about this insanely cheesy Kahlúa “Udderly Delicious”plastic glass which, unfortunately, there’s no way of taking a photo of and showing all the brilliance of at once. 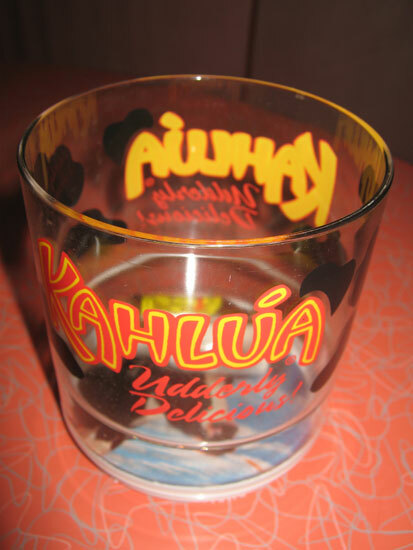 At first glance, it’s just an incredibly cheap cup with the Kahlúa logo and some cow spots painted on it. Plus the excellent “Udderly Delicious” slogan. 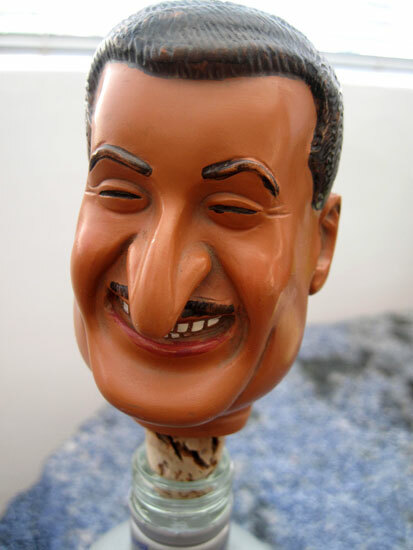 But then you peer inside and see the creature that the udders belong to with a nice frosty drink on its head and two toy bottles, one of which is unmarked, which makes no sense for something that’s a promotional item, rattling around inside on top of it. I’ve always been intrigued with label design, especially when appearing on cans, as the designer has to take the roundness into consideration as well as the inescapable fact that only a portion of the design is going to be seen at any one time. But then imagine having to stack the cans so they become something else. The label still needs to retain its power but must also give power to whatever structure you’re using it to make. 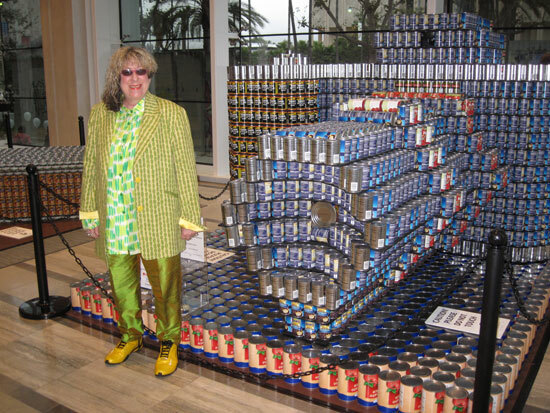 This weekend I had the honor of judging and announcing the winners at the Los Angeles Canstruction awards, a design contest that takes place in over 100 cities where designers compete using canned food as the building blocks to make a variety of giant objects. After the contest, all of the food is donated to local food banks, so the quality of the meal provided in each structure is a very important criteria in judging its worth.